No Need to Install OS X ! No DMG or other image files Needed ! No Need for any Additional Updates or Patches ! What versions of Mac OS can my mac run? WHICH VERSION TO LOAD ? Unfortunately, there has always been a heated debate on which Mac OS 9 version to install. In general, many users have favored the very last revision, Mac OS 9.2.2 as the most stable and preferred version. However, I can tell you from personal experience that it is best to do some research after you decide upon your favorite application(s). You can probably rule out V9.0, V9.02, V9.03, and V9.04 for stability issues and the lack of enhancements. So, you are half way there, with only V9.1, V9.2, V9.2.1, and V9.2.2 to consider. What the hell is 48-bit LBA compliant, you ask? Well, it is the ability of the Mac to see the total number of heads, cylinders, and sectors of large hard drives. We have tested the following Macs and they can see hard drives of up to 500GB within Mac OS 9.2.2: QuickSilver 733, QuickSilver 800, QuickSilver DP 800, QuickSilver 867, QuickSilver 933, QuickSilver Dual 1 GHz with logic board 820-1342-B (QS logic board 820-1276-A will NOT work and peak out at 128 GB), All FW400 MDD models, Titanium PowerBook 800, Titanium PowerBook 867, Titanium PowerBook 1Ghz will work nicely. With drives over 128GB, as far as the Mac OS revision, you will be stuck with Mac OS 9.2.2 only, as it contains Apple Drive Setup V2.1. This version of this app is the first version to support larger drives and will be needed to format and partition drives greater than 128GB. We also recommend that you keep your partitions to sizes of 190GB or less.. exceeding this size has some ramifications .. (2 of them) .. 1st) OS 9 will not boot and 2nd) Norton Speed Disk V6.03 will not be able to defrag it. There is a lot of confusion about Mac Os 9 versions. With the G4 MDD, the rumors about which is the last revision, makes the confusion even worst. 2) This is the only KNOWN source of Mac Os 9.2.2 with CPU version 5.9! 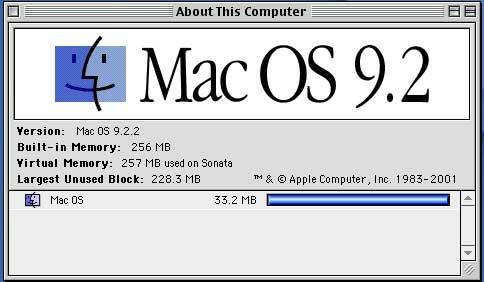 Moreover, even most of the Mac OS 9 advanced users will think that this versions is a Myth...but this is a new achievement of this Mac OS 9 Lives site!